VietNamNet Bridge – The Ministry of Natural Resources and Environment has submitted a proposal to the Government to launch and/or complete 24 climate change response projects in the Mekong Delta region in the 2017-2020 period. This includes nine ongoing projects and 15 new ones. The total cost is estimated at VND11 trillion (US$478 million), of which over VND3.2 trillion will go into ongoing projects. Tran Phong, director general of Viet Nam Environment Administration’s southern chapter, said the total funding for the 2017-2020 projects is 2.7 times more than the previous period. The Steering Committee for Southwestern Region reported that coastal and riverside land erosion in Mekong Delta remained a complex problem in the first half of this year, especially in Ca Mau, Bac Lieu, Soc Trang, Tra Vinh and Ben Tre provinces. Landslides have been reported in 54 locations along Tien River, and 10 spots along Hau River. Kien Giang has recorded 70km of coastal land erosion, 30 km of which is seeing serious erosion. 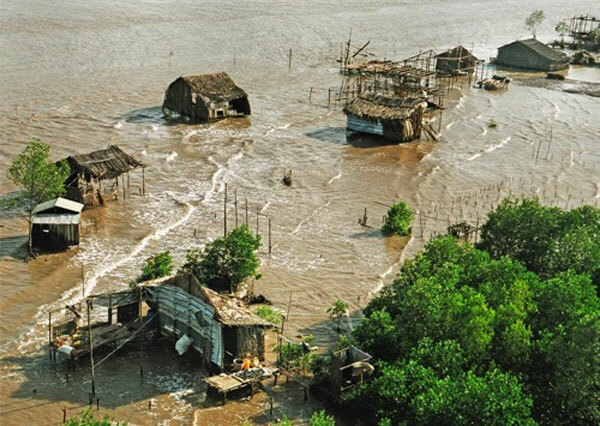 In Ca Mau and Bac Lieu, landslides and erosions have severely affected aquaculture as well as residential areas. The Cuu Long (Mekong) Delta region is spread across 40,500sq.km and encompasses a large portion of southwestern Viet Nam. The size of land that gets covered by water depends on the season. The region comprises 12 provinces: Long An, Dong Thap, Tien Giang, An Giang, Ben Tre, Vinh Long, Tra Vinh, Hau Giang, Kien Giang, Soc Trang, Bac Lieu, and Ca Mau, along with the province-level municipality of Can Tho. The region has a population of around 20 million, and is one of the worst affected by climate change. The average temperature is forecast to rise by 2-4 degree Celsius in Viet Nam, and 40 per cent of the Delta region is expected to be submerged by the year 2100.